We have done quite a few sessions at Great Falls this month but only because it is just THAT beautiful right now! This time, we headed to the Maryland side of the falls to get a little variety! This fall engagement session at Great Falls is just to die for! Whitney and Colby chose such perfect colors for their engagement outfits to match the colors in the leaves and the falls! We just HAVE to share how Colby proposed to Whitney! Every year, Colby’s family goes the Ocean City for one week for Colby & his grandfather’s birthdays even since his grandfather has passed, but they still celebrate the day because they were both born on July 19th! Whitney has gone for 3 years now! Every day, they love to go for a walk on the beach either in the morning, before dinner or after dinner, just because to enjoy the scenery. So you could imagine that on that walk, Whitney figured it was going to be just like any other ordinary walk that they took. Little did she know, she was so wrong! The day before Colby’s birthday, his entire family and some of her family came to the beach to celebrate so that night, they all planned to go to dinner. As usual, Whitney tried to get as ready as she could fighting off the horrendous humidity of the beach… and then Colby asked her, if before they went to dinner if they could take a walk. They headed out the door, and down to the beach! The entire time Whitney complained about how she didn’t to mess her hair up with the humidity if they could make this a quick walk.. that would be great! Colby said yes and that the walk wouldn’t be long at all, completely knowing what Whitney was going to be surprised with! They walked maybe a 1/2 mile and then headed back, almost making their way to the sand, right in front of their house on the beach, Colby swung Whitney around and stared her right in the eyes. He said a bunch of sweet nothings and then got down on one knee!! Meanwhile, both of their family’s were watching them up on the boardwalk; screaming and whistling and trying to contain their excitement! Whitney, of course, said yes and the tears were flowing from the sand to the boardwalk from everyone there! 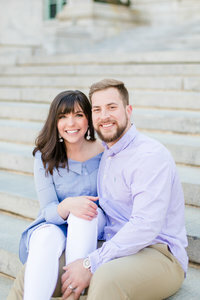 We can not wait for these two to say I do next year at their beautiful venue in northern Maryland!! Here are a few of our favorites from this gorgeous fall engagement session!